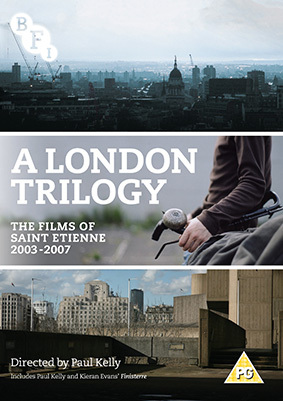 On 15 July the BFI will release A London Trilogy: The Films of Saint Etienne 2003-2007, bringing Finisterre, What Have You Done today Mervyn Day? and This is Tomorrow together on one DVD for the first time. The trilogy is accompanied by a selection of rare and previously unavailable short films. From a beautifully conceived film-poem and an imaginative exploration of the Lower Lea Valley to an uplifting documentary on a London landmark, the collaborations between electronic indie trio Saint Etienne and filmmaker Paul Kelly (Lawrence of Belgravia) document London's ever-changing environment and landscapes with music by the band. Finisterre (2003), directed by Paul Kelly and Kieran Evans, is a homage to London featuring a host of well-known voices including Mark Perry, Julian Opie, Vic Godard and Lawrence who’ve made the capital their own, soundtracked by songs from the Saint Etienne album of the same name. What Have You Done Today Mervyn Day? (2005) follows paperboy Mervyn Day on his round, tracing the fascinating hidden history of East London’s Lower Lea Valley in the years before it was redeveloped to become the Olympic Park. Guest voices include David Essex and Linda Robson. Commissioned by the Royal Festival Hall to mark its renovation and grand reopening, This is Tomorrow (2007) lovingly records the immense labour and attention to detail that went into the refurbishment of one of London’s most distinguished concert venues. A London Trilogy: The Films of Saint Etienne 2003-2007 will be released on UK DVD on 15th July 2013 by the BFI at the RRP of £19.99. The Other South Bank (2008): a look at Teeside’s South Bank. Also included in a 32-page illustrated booklet with an introduction by Paul Kelly and new essays by Bob Stanley, Sukhdev Sandhu, Owen Hatherley and Tom Dyckhoff.